It was smiles all round as Johannes .C. Liebenberg (affectionately known as Sweetpea) accompanied by his family, joined the WDGMC’s Transplant Unit in celebration of his 90th birthday. Mr Liebenberg who is now, our oldest living related kidney donor, donated a life saving kidney to his daughter Lola Liebenberg 28 years ago. The Unit paid special tribute to the exceptional zest Mr Liebenberg has for life, who at the age of 90 is still playing golf twice a week. Professor Rene Botha, a transplant surgeon who has spent his life pioneering kidney transplantation in Johannesburg, toasted Mr Liebenberg as someone who embodies the ethos that kidney donors “can live for a long time after donation as healthy, productive members of our community with a very good quality of life”. Lola lived a healthy life with her father’s kidney for 23 years until routine testing conducted in 2008 showed gradual deterioration in the kidney’s functioning, presenting the need for a second transplant. Lola’s second kidney was donated by Chantal Hathrill, a work colleague of her partner Izak Meyer. 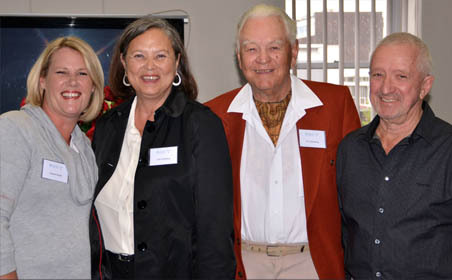 The kidney is currently working very well and Chantal was also thanked by Rene Botha for her selfless gift to Lola, as without the generosity of donors, the living donor transplant programme at WDGMC would not exist. WDGMC Transplant coordinator, Sister Lou Aucamp, who has decades of nursing experience in the field of transplantation, was responsible for managing Lola and Chantal during the second transplant. We salute all at the WDGMC Transplant Unit and wish Sweetpea a Happy 90th Birthday!